College football has a way of being weird. Last week showed that you should never know what to expect on any given Saturday. Though the day got off to a slow start, the weekend had plenty to offer in terms of unexpected drama. This week looks to set the table for a much different kind of drama-filled weekend with a handful of matchups between ranked teams in the Big Ten, Big 12, and SEC, and the primetime battle of top 10 collisions will be a reason to have a second screen available if you don’t want to keep going back and forth between channels. But will this weekend live up to the hype? Or will it be a letdown with games that are less competitive than they could potentially be? You just never know with this sport. Here’s what you should be watching this weekend. 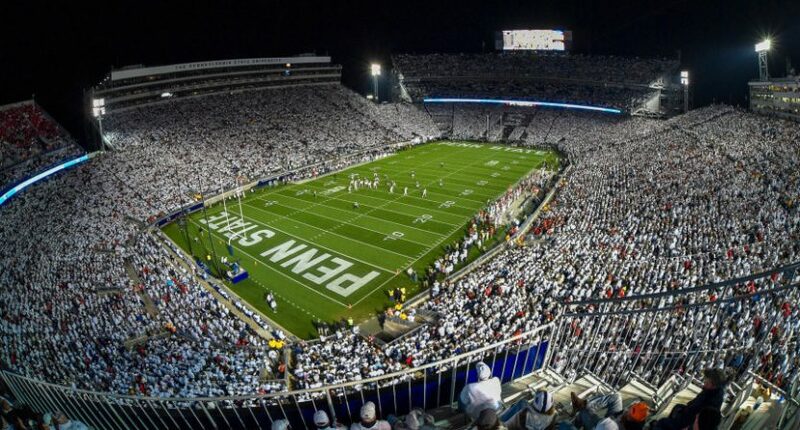 Stakes will be high Saturday night in front of the Whiteout crowd at Beaver Stadium when No. 4 Ohio State pays a visit to face No. 9 Penn State. The last two remaining undefeated teams in the Big Ten collide in a game that could very well determine which team wins the Big Ten East Division title and plays for a Big Ten championship at the end of the year. Not coincidentally, Ohio State and Penn State are also the two most recent Big Ten champions, each claiming a victory over Wisconsin, and the Buckeyes and Nittany Lions once again play a game that carries some potential playoff implications. There is a lot to like about this game. Urban Meyer and James Franklin have had their battles over the years, starting in the SEC and continuing in the Big Ten, both on the field and on the recruiting trail. Meyer holds the upper hand in both areas, but Franklin has brought a charge to Penn State that brings them closer to the Buckeyes than has been seen in a long time. The games have also been good contests the last few years, with Ohio State winning in double overtime in 2014 to ignite their national championship run, Penn State’s blocked field goal returned for a go-ahead touchdown two years ago that helped lift Penn State to an eventual Big Ten championship, and last year’s thriller in Columbus with a near-perfect game by JT Barrett to help Ohio State rally from a 21-3 deficit and a 35-20 deficit in the fourth quarter. So yes, this is a revenge game for Penn State. Scoring that revenge will be difficult because Ohio State enters this week looking like a team equipped to give Alabama a good fight. Dwayne Haskins has quickly moved his way into the early Heisman Trophy conversation, passing running back J.K. Dobbins in the process (and Dobbins is pretty dang good himself). Ohio State has loads of talent and even without defensive star Nick Bosa, the Buckeyes have a defense that should pose problems all night long. Ohio State will want to start fast, something they have become accustomed to doing with the exception of the TCU game. But even against the Horned Frogs, Ohio State had some good early drives that didn’t get as many points as they would’ve liked. Penn State’s defense needs a big game, but this matchup doesn’t appear to be one that will accommodate that. Penn State has a trend of having a good early touchdown drive, but then the offense goes into a slumber until after halftime despite having a big-play quarterback in Trace McSorley ready to make something happen at any given moment. They may not be able to afford to dig a hole this week. Penn State may score some points in the second half, but if they can’t keep Ohio State within reach before halftime, the damage may be too much to overcome even for a solid second-half team. The common reaction to this game is that the winner will continue to hold out solid playoff hopes while the loser will be out of the running. Of course, the winner will stand a much better shot at the playoff moving forward, but whatever team loses will still fly on the radar to some degree. In fact, thanks to their victory over TCU, Ohio State may be in better shape with a loss than Penn State would, because both teams still have to play Michigan and Michigan State. And if the losing team goes 11-1, the playoff may not be too far out of reach, as recent history would suggest. At the same time the Big Ten’s clash of top-10 teams is going on, there will be another one that may actually carry more playoff implications on the result going on in South Bend, Indiana. No. 7 Stanford is on the road for a second-straight week against a ranked opponent, going from a furious rally against Oregon to No. 8 Notre Dame. Like Ohio State-Penn State, this is a matchup of undefeated teams, but the consequences with a loss may be more damaging for the team that comes up on the short end of this one. But before taking a look at how this game plays in the playoff picture, let’s backtrack to last week. Notre Dame head coach Brian Kelly made a notable quarterback change to pull Brandon Wimbush out of the starting job and inserting Ian Book in his place. Although the Irish were 3-0 with Wimbush as the starter, the offense was seemingly lacking something. After getting a few opportunities to contribute in key situations against Vanderbilt, Kelly made the full switch to Book at quarterback against Wake Forest and that paid off in a big way. Book passed for 325 yards and two touchdowns and ran for 43 yards and three touchdowns in a 56-27 win over the Demon Deacons on the road. We may have seen the last of Wimbush in any meaningful role for the Irish. But playing Wake Forest and playing Stanford are two different animals, so we’ll see if Book will be able to be as productive and lead the Irish to a big win this weekend in Notre Dame Stadium. Though Book is not young, he’s inexperienced, and Stanford coach David Shaw will have to come up with a plan to figure him out quickly. The Cardinal looked to be cooked last week against Oregon, but then a fumble returned for a touchdown and a fourth-quarter rally led to a stunning overtime victory against Oregon, in Eugene. Stanford is off to a 4-0 start despite not really having the Heisman-caliber start expected form running back Bryce Love. Instead, it’s been quarterback K.J. Costello that’s helped lead Stanford to early wins, including his 327 yards and three touchdowns last week against the Ducks. Down 24-7 at halftime, Costello and Stanford showed the kind of composure of a team expected to have the ability to compete for the Pac-12 title. The Pac-12 title already feels as though it could come down to the winner of the Stanford-Washington game in early November, but if the Cardinal are going to be a playoff contender, this may be a required win. The Pac-12 is in position to knock itself out of the playoff picture down the line, so Stanford going 5-0 with a big win on the road against a top 10 team would be huge for not just Stanford, but for the Pac-12 as a whole. The Pac-12 has already seen its most popular playoff contender lose to a top 10 team (Washington losing to Auburn), so it may not be able to afford a second. If this one snuck up on you, you’re not alone. After Texas Tech opened the season by getting blasted by Ole Miss in Houston, the Red Raiders have been rolling on offense. Texas Tech rebounded from their 20-point setback in the season opener by blasting FCS Lamar 77-0, but then scored two quality wins with a 63-49 victory over Houston and then a lopsided 41-17 victory over Oklahoma State in a Big 12 opener. As a result, Texas Tech has climbed into the top 25 this week and now looks to defend their home turf against one of the preseason favorites to play for the Big 12 title. Will Grier brings his Heisman Trophy campaign to Lubbock by leading the Mountaineers with a 3-0 record after taking care of Kansas State last week, 35-6. Grier enters the week having thrown for 14 touchdowns with just three interceptions in three games. On the other side, however, is the Big 12’s leader in passing, freshman Alan Bowman. The Red Raiders quarterback has passed for 1,557 yards and 10 touchdowns in four games. Not surprisingly, West Virginia and Texas Tech lead the Big 12 in total offense, and that should lead to quite a track meet in a key Big 12 game. The Red Raiders are averaging 97.0 plays per game, which is just silly. Although Dana Holgorsen isn’t afraid to try keeping the tempo of a game moving as quickly as possible, even he may feel a need to slow things down when needed in a battle of offensive wits between he and Kliff Kingsbury. Former Mississippi State head coach Dan Mullen is making his return this weekend, but he returns as the enemy now. Mullen, now the head coach at Florida after nine years transforming Mississippi State into a program that abandoned their losing ways and strung together eight straight bowl seasons with him as the head coach, may have some fond memories and plenty of familiar faces to embrace this weekend, but he also has a tall order on his plate facing the program he essentially created. The timing is a bit rough for Mullen’s return. The Bulldogs, now coached by former Penn State offensive coordinator Joe Moorhead, are coming off their first loss of the season, a 28-7 setback in Lexington to Kentucky last week (hey, Florida lost to Kentucky too). Although Mississippi State managed to stay in the AP Top 25 after the loss, the Bulldogs are likely ready to turn the page and get back in the win column. And what better way to do that than by sending their former coach home with a loss? Nick Fitzgerald, who flourished under Mullen, is coming off a rough outing after completing just 16 of his 32 passes for 145 yards. As much as he may be looking for some redemption, running back Kylin Hill may be more looking forward to getting back on the field. After virtually laughing off Kentucky running back Benny Snell’s comments and doing nothing to back up that mockery, Hill could use a big game on the ground for Mississippi State. When Mullen left for Florida, Moorhead inherited a team capable of making things interesting in the SEC. Now, for the first time, we’ll get a chance to see how Moorhead gets his team to rebound from a loss. Don’t expect any emotions to carry any influence in this game as it pertains to Mississippi State and Mullen, but Mullen has the advantage of knowing this Mississippi State as well as any coach the Bulldogs will face this season. Moorhead will have to throw in some new wrinkles to keep Mullen and Florida’s defense on their toes. It won’t just be Stanford in the national spotlight representing the Pac-12 on Saturday night. An hour after Stanford kicks off against Notre Dame (and Ohio State and Penn State get started), No. 11 Washington will host No. 20 BYU in a non-conference matchup of top-25 teams. The Huskies getting a second crack at a ranked opponent in non-conference play sort of came out of nowhere given how BYU played last season, but the Cougars are off to a solid start to the 2018 season and looking for a big score. Keep in mind, BYU has already gone on the road and won against Wisconsin. Can they use the same formula to take down Washington on the road? If the Huskies play the way they have this season, it’s certainly not impossible. Washington hasn’t exactly blown the doors off their better competition, other than North Dakota in Week 2. The Huskies had some key mistakes lead to a loss to Auburn in Week 1. Utah was unable to capitalize on their opportunities in a 21-7 road win for Washington. And last week, Arizona State put up a respectable fight in a 27-20 win by the Huskies. Credit Washington for winning these games, but forgive me if that should suggest BYU has no shot at knocking off Washington the way they did with Wisconsin. It probably won’t happen, but it’s safe to say a BYU win against Washington would do some more damage to the Pac-12’s playoff hopes, and probably puts pressure on the Cardinal to run the table regardless of the outcome in South Bend. But there’s still one more top-25 matchup on the Pac-12 agenda this weekend, and it’s one worth staying up to watch. No. 19 Oregon hits the road this week after a punch to the gut last week against Stanford. Perhaps getting away will be some good medicine after blowing an opportunity to knock off Stanford, but going to play No. 24 California may not be quite the best possible situation to look for a rebound this week. Remember that BYU team I was just talking about? They have only lost one game, and that was a 21-18 game to Cal. The Golden Bears aren’t quite lighting up the scoreboard like their past glory days with players like Aaron Rodgers, Marshawn Lynch, and DeSean Jackson, but Justin Wilcox has Cal playing well with a balanced approach starting with dual-threat quarterback Chase Garbers. Cal’s defense has been the calling card for Cal early on this year, and they will have their hands full with Justin Herbert and the Ducks as they look to quickly atone for last week’s inability to finish a game. So put on a pot of coffee this weekend. You won’t want to miss this one.